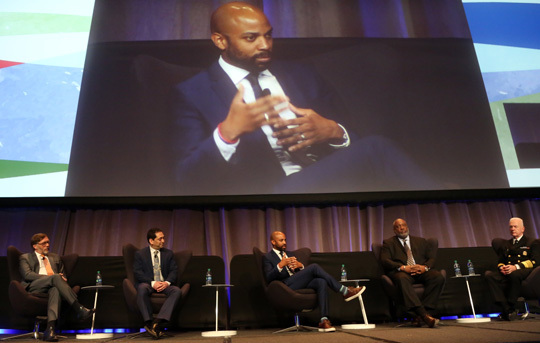 The third plenary session at the CDC’s 2019 National HIV Prevention Conference was held Wednesday morning, March 20. The session focused on the intersection of opioid, substance use and infectious diseases. The session featured remarks by ADM Brett Giroir, MD, Assistant Secretary for Health, CDC’s Dr. Jonathan Mermin, and others who explored roles for health departments, syringe services programs, health centers, and law enforcement. CDC’s Dr. Jonathan Mermin opened the session observing that, “Opioids are a major public health problem in the U.S., not only because there were tens of thousands of overdoses last year, but also because the crisis is increasing infections of hepatitis A, B, and C, HIV, and STDs.” Dr. Mermin is the Director of CDC’s National Center for HIV, Viral Hepatitis, STD, and TB Prevention. He observed that every part of the country has been touched by the infectious disease consequences of drug use. He added that clusters of HIV infections in people who inject drugs (PWID) have occurred in a number of states in recent years due to the practice of sharing needles, which poses a high risk for HIV transmission. Dr. Mermin observed that syringe services programs (SSPs) are an effective, evidence-based intervention to stop these infections. SSPs are a comprehensive program that can provide access to sterile injection equipment and risk reduction education as well as linkage to treatment for substance use, HIV, and viral hepatitis. Dr. Mermin emphasized that SSPs have been shown to prevent new HIV and hepatitis infections by over 50% and do not increase drug use or crime. 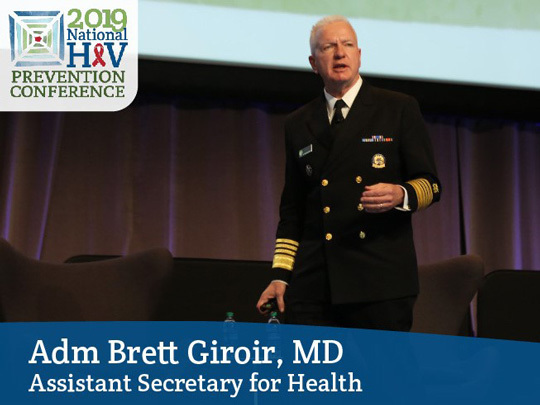 ADM Brett Giroir, MD, Assistant Secretary for Health at the Department of Health and Human Services, addressed the critical public health issues of HIV and substance use, which he observed are inextricably linked. While the opioid epidemic is most often discussed, ADM Giroir explained that the latest data about the extent of the drug misuse and overdose epidemic in the U.S. makes it clear that this is a polysubstance use issue, meaning that many drugs in addition to opioids are also involved. He shared data on overdose deaths by class of drugs. It showed that while deaths from heroin appear to be declining, deaths associated with synthetic opioids and psycho-stimulants like methamphetamine are increasing. He provided an overview of the Department of Health and Human Services’ five-point strategy to combat this crisis. He observed that as a result of this strategy and the programs being implemented in communities across the country, the tide is beginning to turn and drug-related deaths are beginning to decline. He also highlighted a workshop at the National Academies of Sciences, Engineering, and Medicine that was sponsored by his office. This workshop explored the infectious disease consequences of the opioid crisis and considered opportunities to better integrate effective responses. We must recognize the issue and put resources toward it. He explained that the President’s fiscal year 2020 budget proposes $53 million for CDC to focus on infectious complications of the opioid use epidemic. This is in addition to the $291 million in new resources requested to support the Ending the HIV Epidemic: A Plan for America, and other activities already underway to provide enhanced support to communities for substance use prevention and treatment. Expand comprehensive SSPs. ADM Giroir affirmed that SSPs are an evidence-based solution to the infectious complications of opioid use and also for opioid use disorder itself. Building on what Dr. Mermin stated previously, he added that the evidence is clear: SSP participants are five times more likely to enter drug treatment and 3.5 times more likely to cease injecting compared to those who don’t use SSP programs. Even with such results, ADM Giroir observed that work remains to get some states experiencing opioid-related deaths and HIV outbreaks to adopt such evidence-based services. Integrate HIV prevention and substance use services into all that we are doing. As an example, ADM Giroir pointed to the Title X family planning program which this year has added screening for substance use and PrEP to its services that reach millions of young people each year. He also highlighted new data from a survey of opioid treatment programs that showed that only 60% were offering HIV testing and fewer than 10% were offering PrEP or HIV treatment. “We need to get everybody from the HIV and sexually transmitted infections side to be screening for substance use, and everyone on the substance use treatment side screening for HIV, STIs, and viral hepatitis.” This is an enormous opportunity to address these syndemics, he remarked. View ADM Giroir’s slides [PDF, 934KB]. The other presentations and a panel discussion focused on innovative work being done to prevent infectious diseases associated with drug use in a variety of settings and by engaging diverse partners. Marwan Haddad, MD, MPH, Medical Director, Center for Key Populations at Community Health Centers, Inc., discussed how medicated-assisted treatment (MAT) was integrated into the services offered at several community health centers in Connecticut. Dr. Haddad emphasized the great potential for impact on the syndemics of opioid use and infectious disease that could be achieved by engaging the nation’s many community health centers in delivering MAT and other services. Hansel Tookes, MD, MPH, Assistant Professor at the University of Miami Miller School of Medicine, described a model of integrated services at the Miami IDEA SSP. He highlighted the fact that through the comprehensive services offered there, they were able to detect and swiftly respond to seven new cases of HIV among clients who seroconverted while receiving services. By partnering with the local health department, the SSP was able to swiftly start all clients (who were also homeless) on HIV treatment and connect them to the AIDS Drug Assistance Program (ADAP) for continued support for their treatment. The SSP also came up with innovative ways to support HIV treatment adherence for these clients, including pill lockers and a mobile service. Ronald Martin, a retired New York City police officer who now works with the North Carolina Harm Reduction Coalition, spoke about his work to educate the law enforcement community about harm reduction and facilitate community dialogues about SSPs and other services among all key stakeholders in communities. Achieving an end to the opioid crisis, he observed, requires a collaborative effort that includes many partners, including faith communities, law enforcement, and—importantly—people with lived experience of substance use and those working with individuals on the street level. He strongly advocated for engaging everyone in this conversation, developing collaborative plans, and not acting separately. Interested in viewing all or part of the plenary session? CDC’s National Prevention Information Network has the video of Wednesday's plenary session on their Facebook page.